To explain the process of making custom engagement rings, I will share a story of a couple who recently got engaged: Mike and Lindsay! Mike came to me with some ideas of what he wanted. The steps below will take you through the process from consultation to creation. Step One: For our consultation, Mike showed me a photo a ring his soon-to-be wife liked. Mike had a few notes about the ring. Lindsay liked the style but wanted white gold, not yellow. Also, the original ring came with a 5-carat white sapphire, while he wanted to do a real diamond that was a little over one carat. Lastly, he wanted the band to be slightly thinner. Step Two: I went to work finding the right center stone for Mike and Lindsay. He wanted a sparkly stone. Step Three: I provided him with a quote for the project to include the stone, side stones and production. It came to $9,000. He was happy with the quote and we moved forward. Step Four: I presented Mike with a rendering of the ring for approval. Before the mold is made, clients often share any last minute tweaks they may have. In most cases, because of the conversations leading up to the rendering, he approved it right away. Step Five: The wax is made and then a gold is caste. Step Six: The stones are set. In this case, I added the milgrain by hand. And the final bling was ready!! To book your consultation, email me or call me (617-484-0645). Please feel free to include images of styles you are interested in. You can also include your budget and timeline if you have an idea already. If not, I can help guide you. The decision to create a custom engagement ring is made for a variety of reasons. In some instances, one partner or both partners cannot find the exact vision they want in the marketplace. They may see a detail in one ring but cannot find it with their stone preference whether it’s an alternative stone or a rarer diamond shape. In those cases, the recipients may have a traditional vision but want to add their unique style to it. Alternatively, couples want to go against the grain–to be bold and do something that really stands out. 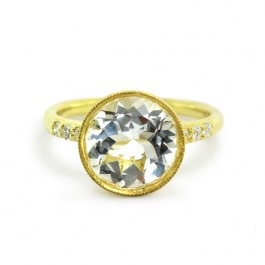 I also tend to see people who would like a particular style of ring but want a more modest version to save money. Whatever the motivation for creating a custom engagement ring, I cannot wait to hear your story and your vision. Guiding you to maximize your budget to match the dream in your mind–that’s my specialty. If you already have a vision, please feel free to email me. I would be happy to give you pricing estimates and options! In the custom project, you’re in the driver’s seat. I merely give you all the facts for each option and you have the final say. Unlike other jewelers, I do not let my personal style preferences dictate my process. I appreciate and admire everyone’s style. However, I advise if a design choice compromises the durability of the ring. 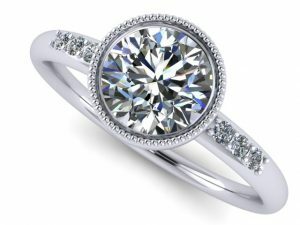 An engagement ring is different from most other jewelry because it is worn every day. Given that, quality is my utmost priority. When you are making this important, you are choosing a jeweler as well as choosing a ring. I want the best for the couples I work with. No matter what your questions and concerns may be, I will help you make the best decision for you. I would be honored to make your time with us extra special. We hope you will become a lifelong customer. We’re a small business and not a corporation or chain so you will get the attention you deserve. To schedule an obligation-free consultation at my store please call 617.484.0645 or email me.